The Homebirth Cesarean project is a book-in-progress about mothers who planned home or birth center births but had to transport to the hospital for a Cesarean section. The project shines a light on the experiences of women who plan an out of hospital birth and then transfer, at some point in pregnancy or labor, for a cesarean. It also serves to honor the experiences of midwives and birth professionals, and to help both moms and midwives better navigate care. What about your personal experiences with birth brought you to your work on this project? As a doula, childbirth educator, midwifery student and apprentice, Courtney was steeped in the world of birth for many years before becoming pregnant. She planned a homebirth and looked forward to bringing her baby into the world at home with her husband and dogs by her side. After over 50 hours of labor, she transported to the hospital during for a cesarean. The shock of this experience and the loss of her homebirth, shook Courtney deeply, as it does many women have homebirth cesareans (HBC). Eight months after her daughter was born, Courtney sat down to discuss the birth with her midwives, specifically, to give them feedback. From that two hour conversation, Laurie’s interest was piqued. She invited Courtney back to discuss writing an article that would shine a light on these rarely discussed, heretofore unnamed births. Courtney proposed a book, and so the HBC project was born. What are some of the responses that you are getting from moms, midwives, and other maternity care professionals? In addition to co-authoring a book with the woman who was her midwife, Laurie Perron Mednick, Courtney started a closed Facebook support group for women processing their homebirth cesareans. The group began a little over a year ago with a handful of friends. It has since grown to over 900 members, including birth professionals who are interested in learning how to better care for HBC mothers. The response from maternity care professionals has been very supportive. 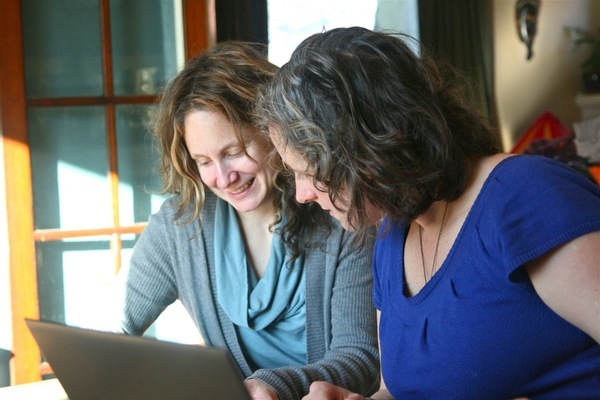 Courtney and Laurie have interviewed professionals ranging from therapists, midwives, OBs, to globally recognized birth experts such as Michel Odent and Sarah Buckley. All shared their insights on the HBC experience, and many mentioned that there was a real gap in the birth discussion about these kinds of births. What form does the research take, what will the book contain, and are you planning on doing anything else with the information you gather? The research for this book is rooted in Courtney and Laurie’s own HBC experience as mother and midwife, respectively. That experience guided the research process, which includes phone, video, and email interviews. The interviews are casual, with guiding questions that help elicit the participants’ views and experiences on HBC topics. The book will feature several complete birth stories, each focusing on a different theme, including two stories from solely the partner’s perspective and one story from mom, partner and midwife. Overall, the book has roughly 15 chapters focusing on a different phase of the homebirth cesarean experience, including prenatal conversations, labor, transfer, the cesarean experience, hospital stay, and what it’s like after the first postpartum year. The appendix will contain helpful handouts for birth professionals and information for HBC families. Overall, the book provides first hand descriptions of what mothers have experienced, and information on how care providers can support women in these circumstances. The research has also given rise to Courtney and Laurie developing a series of classes for birth professionals. The first class offered is called Speaking of Cesareans, and teaches midwives and birth workers how to broach the transport and cesarean conversation with clients prenatally. What sort of things are birth professionals saying about homebirth cesareans? The idea that we need to hear more about HBCs in the current birth discussion was echoed by Michel Odent who said: "If you look at the research, more women want to give birth at home and these births are becoming increasingly difficult. The HBC project is very important because there are going to be more and more women in this situation who have ideals about homebirth, who end up with a cesarean." What sort of things are mothers saying about homebirth cesareans? Mothers often express that they feel like their births are “dirty secrets” of the homebirth community, and that by having a cesarean, they failed the natural childbirth movement they so deeply believed in. Mothers also say that they felt woefully unprepared for the possibility of cesarean, and that they believed that by talking about one prenatally, they might end up causing one. This is magical thinking they now deeply regret. As one HBC mother said, “Can you imagine if we didn’t teach pilots how to crash land because we thought talking to them about it was too scary?” Before this project, a birth that started at home and ended in the operating room didn’t even have a name. Mothers, like the one mentioned above, say that they appreciate having a way to describe their births that feels like it captures the hard work and intention of homebirth while still voicing the surgical outcome. What is one thing you want the public to know about homebirth cesareans? That they happen. They happen to all kinds of women in all kinds of circumstances. They are real births and they deserve to be discussed and honored. Thank you to Courtney and Laurie for sharing this great project with me! I'm not sure a c-section is a great idea to do at home. I hope you at least have a a Doctor that knows what he is doing. c-sections can be very dangerous. Although in general I do suggest a natural home birth. Did you read the article, Philip? This project focuses on women who plan out of hospital births and then transfer to a hospital for a cesarean. Please read this post again. No one is advocating having major abdominal surgery at home. This is wondeful. I had a planned cesarien because of placenta previa. It was horrible, my body refused to accept it. I knew it was the only option but I could not accept it. My baby is now 5 years old and my eyes still sting at the thought of it. Luckily my third son was born naturally and at my terms.